Stephanie, please could you introduce yourself? Hi, my name is Stephanie, I am 32, and I’m a mother of two boys - Walter who is 3, and Holger, who is 1. I’m engaged to Anders and we live in an apartment in Copenhagen, in the Østerbro area. An apartment that we bought from a dear friend of mine. Professionally, I do freelance work within marketing and photography. It started as a creative outlet for me when I became a mother, and I turned it into a platform during my first maternity leave with Walter. I’m happy to create pictures and to work for smaller brands, plus have time to work on a number of personal projects. Speaking of own projects, I’m currently starting up a business with my sister in law Emilie under the name Studio Belle-Soeur. Before motherhood and pictures, I read a lot of books and completed a Cand Merc. in Marketing Communications Management at Copenhagen Business School. I also worked in the fashion industry holding different positions in marketing at two of the world’s leading designer lifestyle brands. Do you have any local tips in the Østerbro area you’d like to share with other families? We moved to Østerbro in May last year, and we've been so happy with this area ever since. The community here is great, and you find a lot of families with children – and playgrounds all over, too. Some of our favourite playgrounds are at Rosenvængets Alle and in Classens Have. Other places like the Østerbro Library or Trafiklegepladsen in Fælledparken are also always fun to visit. On weekends, it has almost become a routine for us to stroll by our local bakery Meyers and pick up coffee and a cinnamon roll to go. On warmer days, we go for ice cream at Østerberg. Home to me is a feeling. Somewhere you can be you. Or just be. I’ve lived in a few places that never felt like home. I can’t explain why they did not feel like ‘home’, other than that’s just how it felt. Our home now is one of the most home-feeling places that I’ve ever lived. I love the atmosphere in our apartment. Of course, it would be easier with our own parking lot, a house and a garden, as I wouldn't have to walk up and down to the third floor with two boys every day. But I choose to do this, and it’s because of the feeling that I have, when we are at home here. And there’s nowhere else I want us to be right now. I would describe it as classic Scandinavian, “Hammerhøisk” with a touch of boho chic. I also try to find a balance between new designer brands and the Danish design classics. What inspires you when it comes to interior design? Where do you find inspiration? 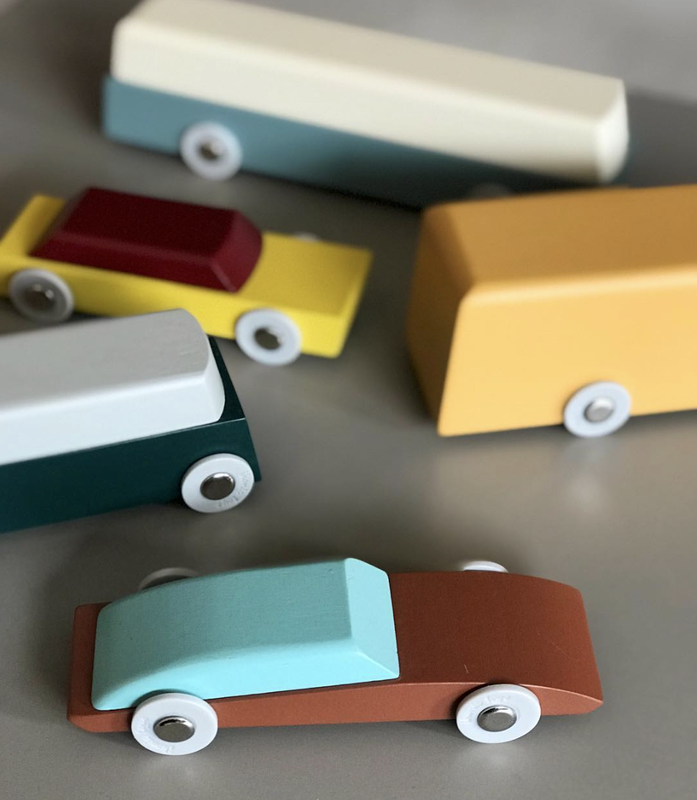 I find inspiration about home and decor on Instagram and on various online shops. I also admire my sister in law Emilie’s creative skills, and I often find inspiration in their home. I also have an auntie that inspires me a lot. With her, I often discuss new potential buys, and when my auntie and uncle visit, we always end up having moved some furniture and lamps around. I’m a person that loves inspiration from others, and I make decisions based on all the ideas and suggestions that I receive. I also enjoy to follow private people on Instagram. In the same way, I hope to create inspiration in relation to motherhood and fashion, as I find inspiration in others. It is a two-way thing. The Banwood Balance bike and clothes in one corner of Walter and Holger’s room. Also there, sweaters from Danish brand Holmm, and night wear from also Danish On Cloud Nine. Lovely little details. One favourite past-time activity is to read. What is your favourite place(s) in your home? If you asked Walter, he would promptly say his bed - Walter absolutely adores his bed and really enjoys playing and sleeping in it. He was so proud when he got a “big brother-bed”. I do find their room (and his bed) to be one of my favourite places in our apartment. However, as a mother and a fan of conversation, I would also mention our kitchen and dining room. I treasure our mornings eating breakfast – sitting all together, waking up and chatting about the funniest things. We are teaching Walter to set the table and to help out in the kitchen. And while Walter helps me, Holger prepares something for us in his little Brio kitchen next to us. It makes me happy when we are together and having fun while doing the simplest everyday things like preparing dinner. How, if at all, has your style changed after becoming parents? Overall, our interior has only changed somewhat after having kids. I must admit, though, that I’ve been more aware on sharp corners – so our home has become softer in both look and feel than before. I love the different structures that you find in wooden materials, and the pure and organic look that wood radiates. I also love how the wooden materials are easy to clean and just become more and more beautiful over time. Our new apartment has a beautiful light, and I chose a lighter deco to match this. 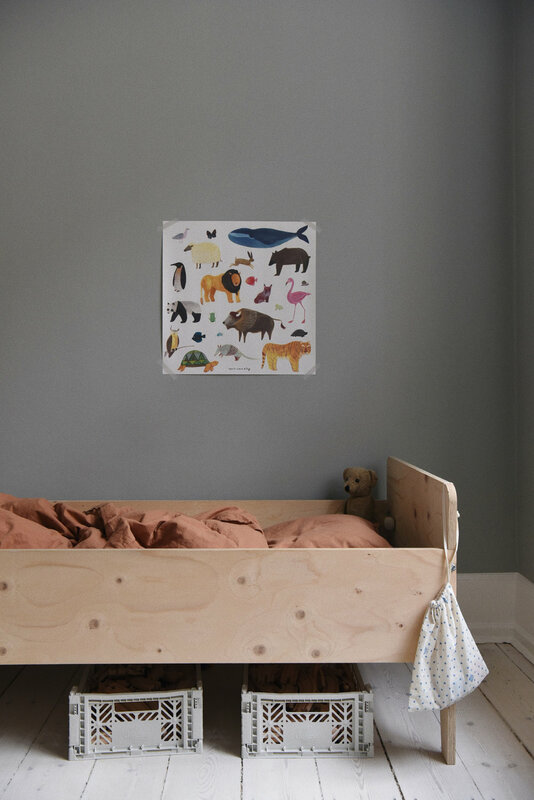 Under the ‘Animals’ poster sits Walter’s toddler bed, created by Dutch designer Piet Hein Eek. Storage boxes are used under the bed for toys. Bed linen in colour Caramel. 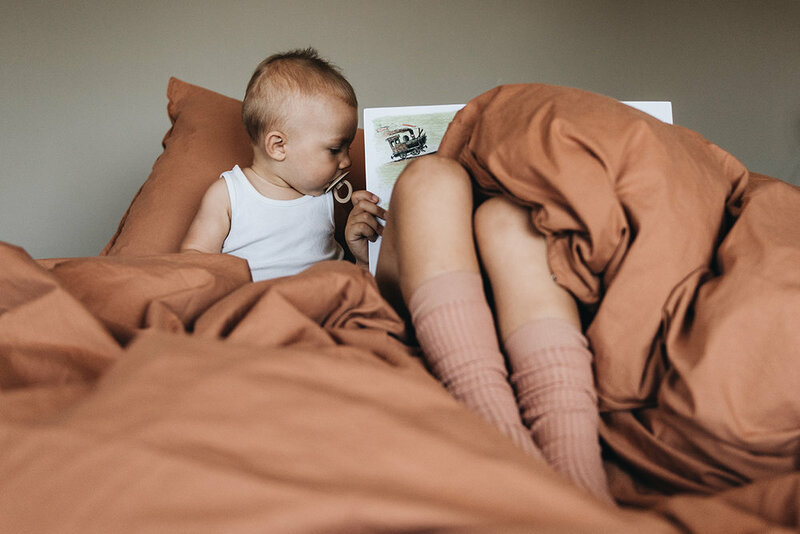 Organic bed linen and the Mini Rattle from Leo Leo Copenhagen. With two boys close in age, please share your necessary buys and what you’ve reused? With just 24 months between our boys we decided to upgrade our Bugaboo Buffalo stroller to the Donkey Duo2, and once again it has proved to be a brilliant investment. In short - this stroller works perfect for us! Walter and Holger are both born in end-November, which has given us a match in wardrobe sizes. For example, Holger is wearing outerwear and other pieces this winter that Walter wore last or previous winter. I find it so cute to see Holger wear what Walter did at his age. However, no shoes match. So, all of Holger’s shoes are new. But I also wanted his first shoes to be his own. New soft toys were also important for me to give him so he had his own to cuddle. 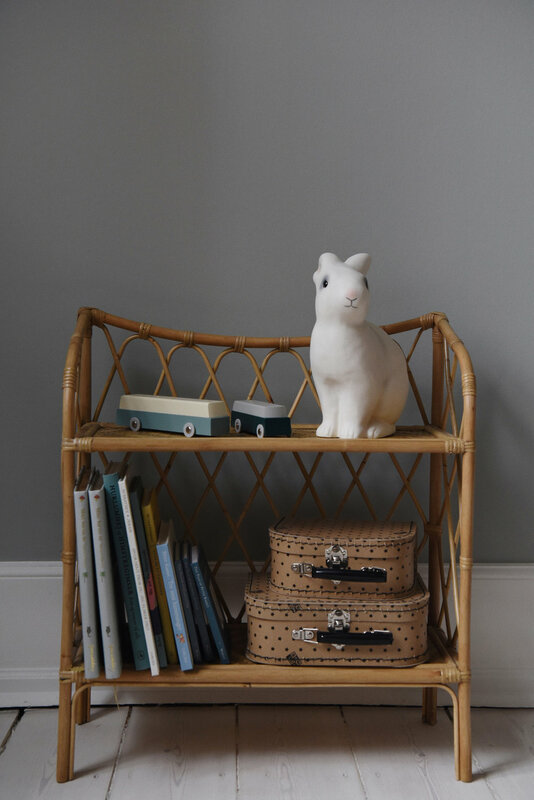 Other things like books, decor and toys are shared between them. 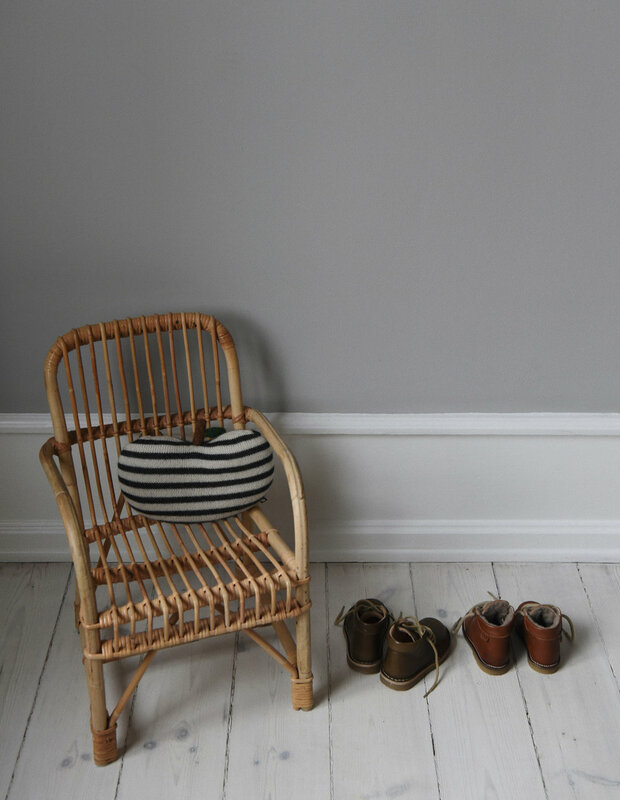 The striped Apple Pillow from Oeuf NYC and some of Walter and Holger’s shoes. Some of Stephanie’s favourite kids clothing brands are Holmm, Bonton, Caramel, and Co.Label. 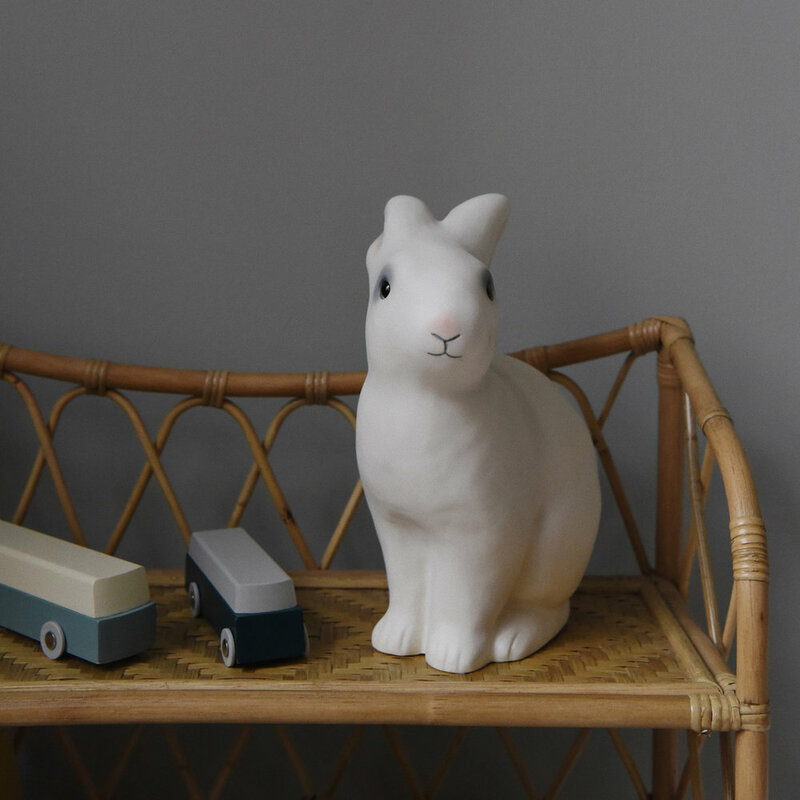 The Bunny Lamp next to the colourful, vintage-inspired model cars from Ikonic Toys. What are your top 3 things to buy when having a baby? 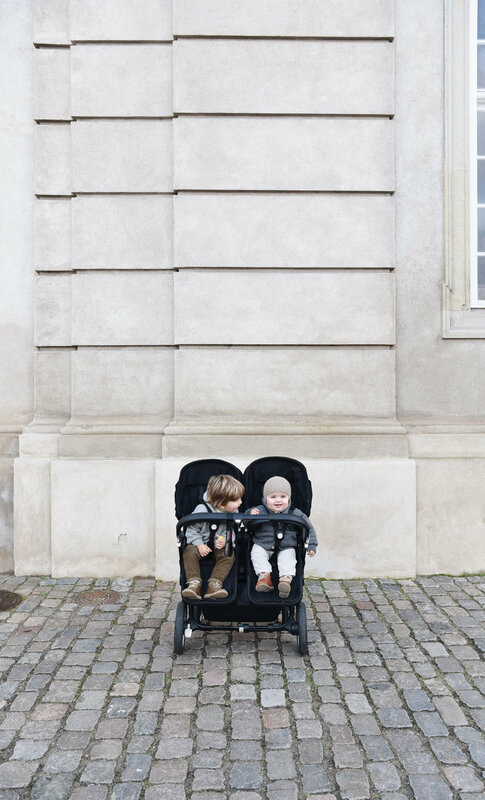 Based on my own experience, these are the top 3 things you need to have: A Bugaboo stroller, a baby nest for newborn babies and an organic, supersoft merino wool fleece suit or jacket from Engel. What do you do when you have an hour free to yourself? I would love to say that I go for a run or do some other kind of exercise, but I must admit that I often find myself making a decent cup of coffee and then work on my photography, or I catch up with my girlfriends. I appreciate friendships just as much as family, and many of my girlfriends are also mothers now, so I love how we can talk about ups and downs and motherhood, too. What means ‘when kids live there, too’ to you? Other than brio trains and tracks, cars and other toys all over the floor... It warms my heart to see how smaller furniture has moved in with Walter and Holger over time, and I also love to find their little shoes on our floor.